Oral health is important for everyone, but particularly for children. Kids who learn healthy habits at a young age can have bright smiles for a lifetime. 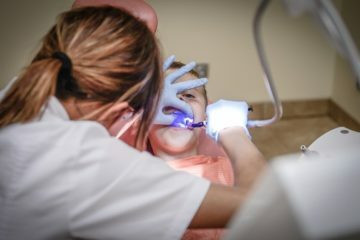 In honor of National Children’s Dental Health Month, which is coming up in February, here are some tips to keep your child’s teeth healthy. Take care of your baby’s gums and teeth to prevent cavities and help your child get used to the feeling of having the mouth cleaned. Starting early will make it easier for him or her to adapt to brushing and flossing later. Clean your infant’s gums after each feeding. 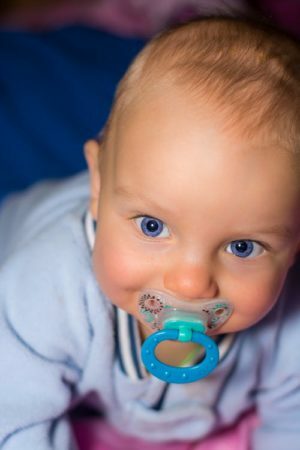 Simply wipe your baby’s mouth with a damp piece of gauze or a damp washcloth. Once your baby’s teeth begin to erupt, gently brush them with a soft-bristled toothbrush and a small smear of fluoridated toothpaste. It is important that you not use too much toothpaste because that could lead to fluorosis, which could leave stains on the teeth. When your child is around three years old, you can let him or her start brushing. Demonstrate proper technique and let your child try. Getting started early will help your child get used to the idea of brushing and establish a routine. Play a song for about two minutes to make the experience enjoyable and teach your child the recommended amount of time that should be spent brushing. Young kids don’t have the coordination to do a good job, so you should always follow up by brushing your child’s teeth yourself. Many parents put their child to bed with a bottle or allow a toddler to carry a sippy cup while playing. If you do that, the bottle or cup should only be filled with water. When kids sip a sugary liquid, such as formula, milk, or juice, slowly over a long period of time, the teeth are continually exposed to sugar. That can cause acid to erode the teeth and lead to cavities. 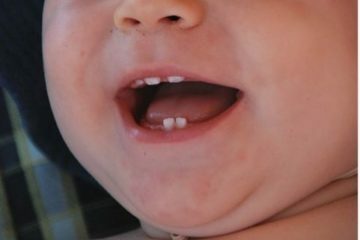 This common problem is known as baby bottle tooth decay. Make sure your child eats a healthy diet. Limit sugary snacks to mealtimes and make sure your child brushes or drinks water after eating sweets. All children should see a dentist by their first birthday. The dentist will count your child’s teeth and check for any early signs of decay. He or she may recommend sealants or fluoride treatments to protect teeth from cavities, especially if your community does not have fluoridated drinking water. Kids learn a lot by observing their parents. If they see you eat healthy foods, brush and floss regularly, and visit the dentist for routine exams and cleanings (without making negative comments about your experiences), they will consider oral health care a normal and important part of life. Good oral health is critical to children’s development. If your child is due for a dental exam, or if you are concerned about a problem, schedule an appointment with CT Pediatric Dentistry today.